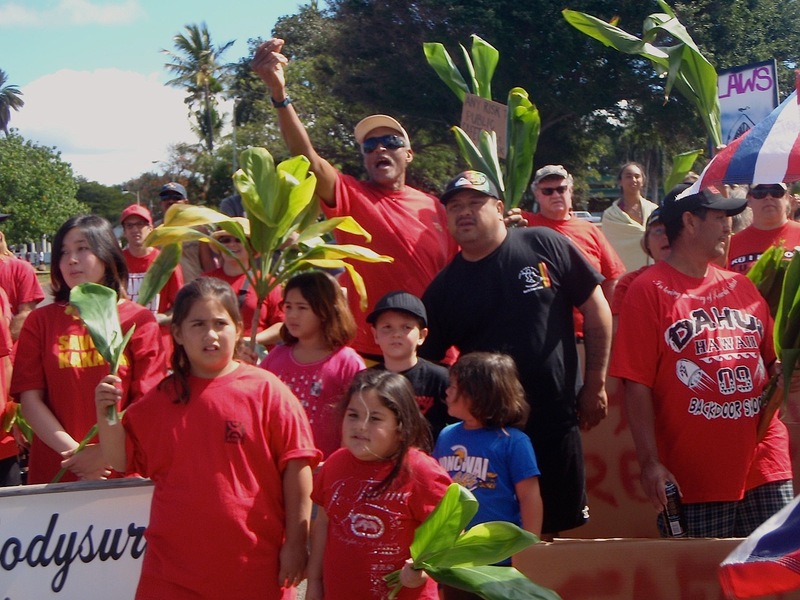 Our warriors have fought, and continue to fight, great battles for the protection of ʻiwi at Wailuanuiahoano – where, like you, brothers and sisters are fighting imminent desecration due to park development plans — and Naue, Kauaʻi, where development interests have been building a luxury home upon the bones of our ancestors, at a sacred leina ka ʻuhane point at which spirits jump into the next world to join their family as ʻaumakua (guardians). A similar struggle is taking place at Kawaiahaʻo, Oʻahu, where a church’s plan for a multipurpose center is impacting hundreds of remains. We are preparing for battle over an elevated rail project that threatens untold hundreds, or possibly thousands, of burials. Longstanding battles over ʻiwi at Mōkapu (a military base from which wars are launched across the whole world); Ahuena Heiau, where bones are being washed up on to the shores of Hawaiʻi Island; and many other important burial sites have also been ongoing for decades. Similarly, we are also battling for the protection of some of our most ancient and sacred temples and sacred landscapes. Notably, there is a great and ongoing battle to protect Mauna Kea, the tallest mountain on Earth when measured from the bottom of the ocean and the resting place of our most revered ancestors, and Haleakalā, Maui’s highest mountain, from the over-zealous development of enormous mega-telescopes. Our practitioners are still struggling to heal Hālawa, Oʻahu, birthplace of Papahānaumoku (Hawaiʻi’s Earth Mother), after the construction of the most expensive freeway per mile on Earth (built for swift military deployments), which we know will not last nearly as long as the destruction it has caused. Meanwhile, geothermal development threatens the sacred lands and fire of our revered goddess, Pele. The Western tip of Oʻahu, Kaʻena Point, has also been harmed in the name of “environmental protection”, including the violent harassment of cultural practitioners and the recent erection of a monstrous fence, which cuts through Oʻahu’s most sacred leina ka ʻuhane site, into the ocean. Meanwhile, like you, our greatest battle is the daily struggle to teach our children to remember that we walk in the footsteps of of our ancestors, and that they live within us. We strive, as you do, to teach them the ways of our kūpuna; to ensure that they will inherit a world in which they can thrive and help others to thrive; and to do as much as we can now in order to lighten the great burden that their generations will have to bear, due to the poor choices being made by the civilization in which most of us live. We work to ensure that they will know in their hearts and spirits that a relationship to the land does not necessitate the building of a park, but the protection of the ʻāina and her people – past, present and future. We strive alongside you to help them to be the torch-bearers for future generations. Our battles are many. They are hard and often brutal. However, like you, our love for the land is stronger than all of the hardship, wrongdoings, ethnocide and brutality that comes in the way of our protection of that which is sacred. As kupuna Harry Mitchell once famously wrote, kauliʻi makou, nui ke aloha o ka ʻāina — we are few in number, but our love for the land is enormous. Like you, we are strengthened in the knowledge that we are here forever, and that we will continue to persevere until both land and people once again thrive together, enlightened by the wisdom of our kūpuna. And we are strengthened by the knowledge that brothers and sisters are standing for the protection of land and culture, as you are standing at Sogorea Te. The great love, bravery and perseverance of our warriors who stand against desecration reverberate with you as you make your stand. May you be blessed with vision, strength, understanding, guidance, mana and joy as you stand in protection of the land that you love. And may the great cosmos turn the hearts of humanity to stand with us all. And many others dedicated to the protection of the ʻāina, people and culture of Hawaiʻi nei. Additional signatures are still coming in. Please check again soon! The signatories of this letter are not of any one organization, but represent many different groups, struggles and efforts in protection of our land, culture & people. It is our collective Aloha ʻĀina, love for the land, that we want to share with you as you stand for Sogorea Te. Blessings!!! This statement was re-posted from Aloha Revolution, May 2011. 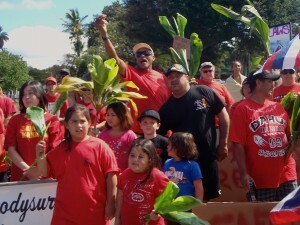 I feel that this connection is a ho`ailona for all of us that are presently defending the sanctity of our na iwi kupuna. I send my warmest aloha and success to our cousins in Glen Cove, I can relate completely on why they are doing what they have to do. We are connecting the bones! Mahalo ia Te Atua! We must mālama the heritage. While all that is new is not necessarily worthless, giving respect and dignity to that which has gone before (both pono and hewa) is necessary. No matter how good one’s intent, tear away the roots and nothing of value remains. I would like to add my signature of support for the people at Glen Cove. We also don’t shop at the “Dead Mall” in Emeryville, which was built over a shellmound and burials. 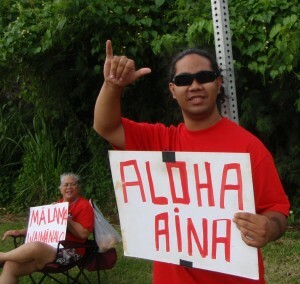 Mahalo for allowing me to show my support for your efforts…my deepest wishes for a successful outcome. Malama pono…aloha ‘aina! 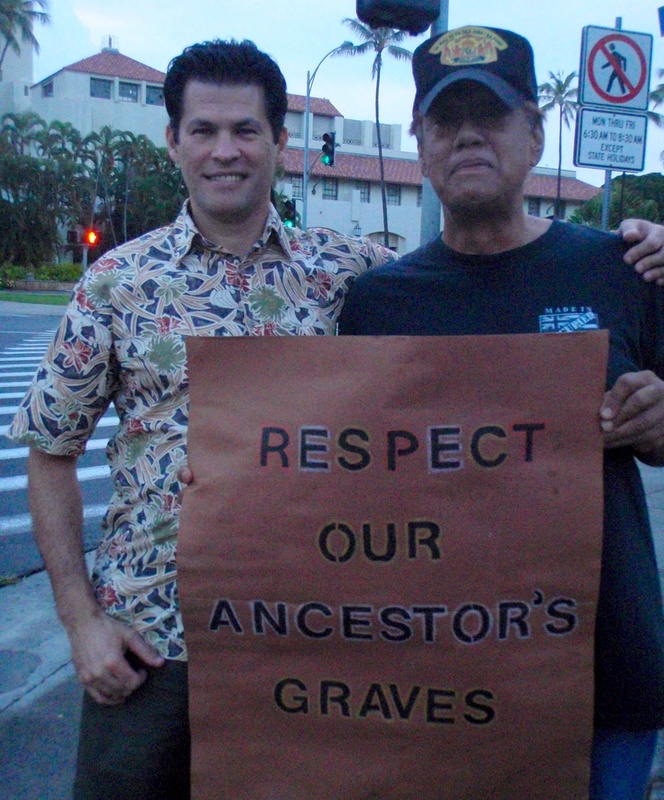 I offer my passionate support for your work in Glen Cove!…yes, we need to malama the land, people, and culture! Once upon a time in a shipping container turned into a makeshift storage unit that had shelves that held cardboard cartons that held the remains that were unceromoniously dug up at the Walmart site, I stood, accompanying to Kanaka Maoli women, Ka’anohi and her neice, Keala. We had been part of a small contingent of people that came to oppose the grand opening of Walmart and Sam’s Club, because of its blatant disregard for sacred places evidenced by the desecration of the burial sites at this location. For a few moments that stretched into what seemed like an eternity, we stood with our heads bowed, offering our respects and our prayers. Ka’anohi nodded to her neice, Keala, who then approached a little table and removed what appeared to be a small washcloth that covered some of the remains that were in the process of being “studied and examined” by an archeologist. An overwhelming feeling of sadness and grief came to rest upon me that day, a deep sense of kaumaha, I was told. I had dreams of kupuna who had gone on and had to seek the advice of Ka’anohi, who as lineal descendant to many of the kupuna whose graves were dug up, was in my estimation, the best one to consult with. She comforted me in the gentlest of ways and helped to allay some of the fears and doubts that arose in me, not knowing really what all of this implied in the different ways that it might. Having seen the face of blatant disregard for Native Culture and the willful desecration of Sacred Sites, and understanding the underlying racism that often is the engine that drives such rude incursions into Native places and spaces, I offer my respects, support and solidarity to all who have converged upon Glen Cove to protect it. In solidarity with the struggle for Sogorea Te from San Francisco!! Stop the racist development of Glen Cove!! Parks should be built to celebrate life, wisdom, happiness and truth – not to destroy culture, desecrate the ancestors, and hurt the aina. My heart is with you as are my prayers for justice.